This course is your gateway to a career in real estate, the most diverse, fascinating and dynamic asset class. 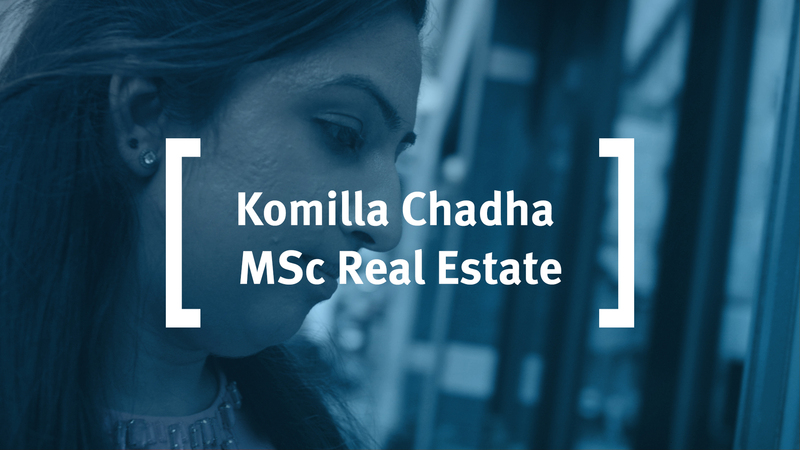 Komilla Chadha studied on the MSc Real Estate at Cass Business School, the only business school offering a master's in real estate in London. In this video she tells us about her role as a surveyor at JLL in London and also how her passion for food inspired her to set up the JLL Dining Club. Track record: Established 20 years ago, and accredited by the Royal Institution of Chartered Surveyors (RICS), our degrees are widely recognised and highly valued by major employers; you will find Cass Real Estate graduates at all levels in leading real estate firms around the world. Capability: You will be taught by highly qualified real estate staff, all with at least 10 years’ experience in teaching in senior roles in the industry and active in research. And we draw on London’s unmatched pool of industry professionals to act as visiting lecturers and guest speakers. Focus: Cass only offers Real Estate courses on a postgraduate level – so you have the exclusive attention of our staff - and has specialised in courses which blend the professional, financial and practical skills in high demand across the real estate industry. Location: We are the only Business School to offer real estate programmes in London, with the opportunity to network in a global real estate hub, neighbouring both the City’s financial core and the new tech belt centred on Silicon Roundabout. Equip you with the core skills required by the industry embracing valuation, financial modelling, development appraisal, market analysis and cash flow modelling. Are set in a framework of robust quantitative methods, financial and economic theory. Have an emphasis on up to date industry techniques and practical tools taught hands-on in computer labs. MSc Real Estate Investment requires a stronger background or aptitude in quantitative methods - from mathematics at final year high-school level, a degree with a quantitative element, or work experience. The course covers the same core “real estate professional” skills as the MSc Real Estate, but extends it to advanced methods in financial modelling, industry research and portfolio analysis, and covers in more detail the financial markets created by Real Estate Investment Trusts and Mortgage Backed Securities. Graduates from this course may enter the same businesses as those from the MSc Real Estate, but will but will be better qualified for “real estate analyst” roles in investment strategy, financing and research. Chat to one of our MSc in Real Estate students now and have them answer your questions on everything from application to student life. An introduction to the real estate industry and the careers it offers, including a dedicated real estate careers day with briefings form the RICS and a range of employers and a Careers Fair with over 20 leading firms. Foundation courses in the principles of finance, financial mathematics and quantitative methods to introduce the key concepts and methods you will use through the year. In our first term, you get the portfolio of core real estate professional skills – taking in quantitative methods, valuation and investment appraisal methods, asset management and understanding real estate markets. In the second term, module choices provide two learning “pathways”. If you aim to join the graduate entry programme of the major UK real estate employers and take the RICS Assessment of Professional Competence you can pick modules that tilt toward UK-specific topics in law, tax and applied valuation. If you aim to work in fund management, finance or outside the UK, you can tilt toward advance financial modelling and international markets. Either way, your choice will not pre-determine the jobs available to you. A module to set out the financial principles and core techniques used in valuation, cash flow modelling and investment decisions, which underpin the rest of the course. You will learn how to value a building, how to use forecasts to model future cash flows and investment returns. To assess real estate markets and investments you will need skills in data analysis and business statistics. The module, from a base no higher than middle-school mathematics, shows you how to manipulate data and apply statistics to answering practical questions like measuring the return and risk on investments and using a basic regression model to explain market trends. The management of real estate is critical to the success of all businesses. This module looks at issues like the role of real estate in firm strategy, cost control and benchmarking, layout and working practices which are critical for both occupiers of space and property owners who provide the space. A course in economics is standard for all Business School students. Here you will learn not only those general economic principles but also how they apply to real estate: what determines rent in different places, how differences in rent shape the skyline of our cities, why real estate development notoriously swings from boom to bust. Shows how the principles and basic methods covered in Term 1 are extended to cover specialist property types like pubs and hotels, and are used in negotiations between landlords and tenants to decide terms for giving up, extending or transferring leases. Real estate is often financed with a mix of equity and debt. Here you will learn the cash flow modelling techniques which underpin the use of senior, junior and mezzanine debt packages, and how to measure their impacts on the returns and risks of investment, with ample use of case studies and hands-on computer classes. Examines the statutory aspects of appraisal in the UK. Rating law and procedures, and taxation, particularly capital gains and value added tax, are also studied in depth. Provides a sound knowledge of legislation and case law affecting the commercial property market in order to enable students to apply the legislation when undertaking valuations and appraisals of such premises. The module first covers the main forms of real estate investment – direct, unlisted funds and listed companies – to develop an understanding of the structures used in the capital markets, and their performance. It then examines the approaches used by investors and fund managers to set investment objectives and structure portfolios to meet those objectives. A development is like a new business start-up, with a sequence of high-risk steps to go through – planning, design, financing construction, letting, final sale. The development module shows how those steps are managed, the valuation and cash-flow appraisals that drive development, with a case-study and hands-on modelling approach. The last block of your course, the Business Research Project (BRP), is the one you design and build for yourself. It takes the form of a report of around 8,000 words submitted in August. We see the BRP as your opportunity to have a showpiece which shows potential employers what you know, what you can do, your ability to produce good-quality individual work. Or look in-depth at specific development projects (Kings Cross in London, a resort in Montenegro). Added core real estate topics like building management, sustainability, residential markets. Or on the investment aspects of the industry like REITs, real estate funds and portfolio construction. Or pick up on more general topics such as private equity and project management taught by experts from other Cass programmes. All core modules in Term 1 and Term 2 are assessed by sight-unseen examinations (in January and April) plus coursework set and delivered in Term time. Elective modules are assessed by coursework only. Your coursework will take a range of forms - essays, modelling projects, presentations, class tests. Some are done individually, others in self-selected or allocated groups of up to four. The mix of assignments is designed to develop the general and soft skills employers expect – time management, team working, report production and presentations. Overall your final masters mark will be assessed on 50% exams and 50% coursework. Your Course Director will be Dr Mark Andrew, Senior Lecturer in Real Estate Finance. At Cass since 2007, Mark has over 15 years teaching experience. He is a highly skilled quantitative analyst who has published over 20 papers and a number of government commissioned reports on his research speciality in residential markets. Stephen teaches on the Real Estate Asset Management module. Head of Real Estate at Cass for the last thirteen years. Before that Tony had twenty years’ experience in real estate research as Partner as Property Market Analysis and Director at Investment Property Databank. His contribution to property research has been recognised by the awards of a Lifetime Fellowship of the Society of Property Researchers, and an Eminent Fellow of the RICS. Previously Head of the School of Surveying and Planning at Kingston University, Sarah is a widely published author – over 30 papers and reports plus a valuation textbook - with interests in valuation, sustainability and land management. She is an elected member of the Governing Council of the RICS, and has been an RICS APC assessor for 20 years. Sarah teaches on the Property Valuation module. The largest proportion of our students go on to the graduate entry schemes of major firms of chartered surveyors in the UK, going through the RICS Assessment of Professional Competence to become qualified professionals. The others go into a very wide range of employers and roles – with smaller niche agencies, fund managers, developers, investment banks, lending banks, public agencies, rating agencies, research companies, not to mention setting up their own businesses. Many will go on to professional qualifications outside real estate, such as Chartered Financial Analyst Institute. Around half our students come from outside the UK, many of them take up jobs in other countries with the boost that a degree from Cass, accredited by the Royal Institution of Chartered Surveyors, is a widely recognised and highly valued qualification world-wide. And they will generally find Cass real estate alumni already there to form the base of their professional network. From week one, we host recruitment visits from all the largest real estate employers – like CBRE, JLL, Cushman Wakefield, Savills – plus other firms in real estate fund management, development, finance. Our real estate specialists in the Cass Careers Service hold contacts with businesses across the industry, and will notify you of job opportunities as they come in through the year. 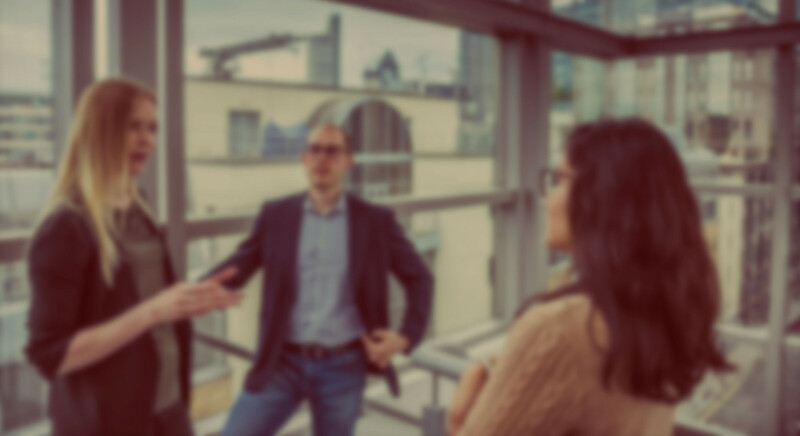 You will have un-matched opportunities to network with professionals and employers across London’s vibrant real estate industry at seminars and an annual conference run by our students’ Real Estate Club, and through our mentoring scheme which matches you up with a Cass graduate, and through industry events outside Cass. The remaining industries are made up of Agency (Marketing, Advertising, PR, Digital, Media, Recruitment), Consulting - Other (2%), Development - Finance or International (4%), Fashion / Design (4%), Financial Services - Investment Banking - Wealth Management (2%), Financial Services - Venture Capital / Private Equity (2%). The Royal Institution of Chartered Surveyors (RICS) accredits the course, enabling graduates to enter the RICS Assessment of Professional Competence (APC).